Panic Selling - What Does It Mean? 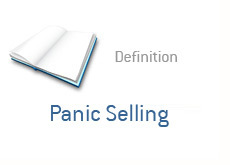 What is the definition of "panic selling"? Panic selling is just as it sounds - it occurs when investors dump their shares in a panic. In a panic selling situation, investors are driven entirely by fear. The most obvious of panic selling occurs when the markets sell off quite a bit and investor sentiment starts to change. Negative headlines start to permeate the newspapers, and many investors suddenly start to get an uneasy feeling in their stomachs. Instead of calmly re-evaluating their positions, many investors will simply pull the trigger and sell all of the stocks in their portfolio. Panic selling results in poorly thought-out, irrational decisions that many investors usually end up regretting. Panic selling will often create great buying opportunities. Many investors dumped any and all shares in their portfolios after 9/11. They were (rightly) very spooked about the economy, the market and their lives in general. People just wanted out of the markets, and at any cost. This panic selling created some incredible bargains at the time. Many well-known stocks hit multi-year (and even multi-decade) lows as investors bolted the markets. This turned out to be a great buying opportunity, as the US economy quickly recovered. Investors were filled with emotion and let this dictate their decisions in the aftermath of 9/11. This resulted in wide-spread panic selling. Will We Retest November Lows?